The Japanese technique of woodblock printmaking is very different to the Western technique. 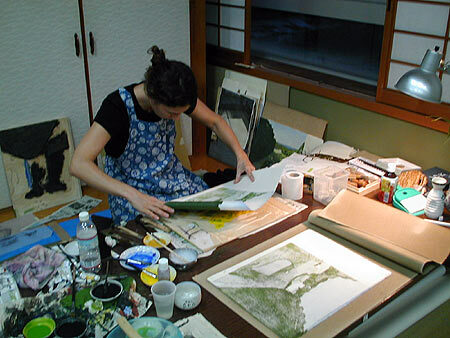 While in the Western tradition, oil-based ink is applied with a roller and printed onto the papers surface often with the help of a press, however in the Japanese tradition, the water-based ink is applied with a brush and, while being printed by hand, is pressed deeply into the absorbent Japanese paper. 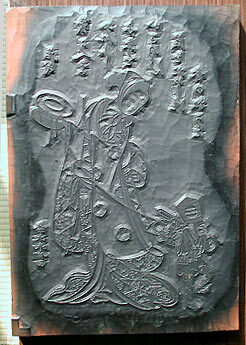 Woodblock printmaking came to Japan from China probably around the 8th century. At that time the two countries were connected by an intesive cultural exchange. Probably under Chinese consulting, in 770 the print of some of the first known text prints was finished: the dharani, ordered by Empress Shotoku, Buddhist verses, each stored in a small wooden pagoda. However, it is not proven from which material these plates were made. In the beginning, woodblock printmaking was done only in Buddhist monasteries, for the purpose of reproducing Buddhist texts and images, later also for books. Only in the beginning of the 17th century printing was also done in private studios. The first prints were just black-and-white. Japanese woodblock printmaking had its prime during the Edo period (1603-1868). After centuries of civil war, this was a time of inner peace. In 1603 the sovereign Tokugawa Ieyasu had won an important battle and became the new shogun. This position was kept by members of his family until 1868. He choose the fisher village Edo (today Tokyo), where he already had installed his headquarters, as the new capital, far from the Emperors court at Kyoto. The new capital grew very quickly and attracted crafts- and salesmen. A rich middle class developed with an intense cultural life, especially because the restrictive regime refused its citizens any access to political power. Theatre, sumo and brothels got very popular. The artists expressed the spirit of this new time in their images, the ukiyo-e, which means "images of the floating world". In the middle of the 17th century, the artist Moronobu as one of the first created a single sheet woodblock print. These new, reasonable priced prints became very popular. The woodblock prints were created in teamwork of publisher, artist, cutter and printer. Also involved were craftsmen like papermakers. The first just black-and-white prints (sumizuri-e) were soon coloured by hand (sumizuri-hissai). The available colour palette soon became bigger, and also metal dust was used. In the first half of the 18th century, the printers began to print from two or three plates and soon the cutting of registration marks, the kento, were invented. This technique made it possible to print from many plates with high accuracy. 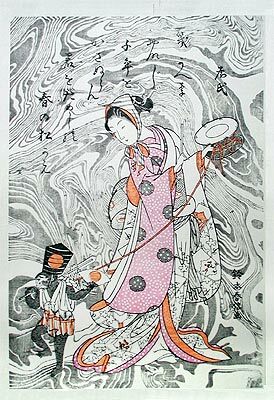 The artist Harunobu was one of the first who brought this technique to its prime by designing prints from more than 20 plates. These magnificent new prints were called brocade images (nishiki-e). There was a big variety of themes. In the beginning, legends were the main theme, and images from the popular kabuki theatre. The artist Harunobu designed prints showing scenes of everyday life. Utamaro was famous for his fine portraits of beautiful women. In the end of the 18th century, landscape and animals too became themes of artists as the masters Hokusai und Hiroshige. In 1853, American ships forced Japan to open her harbours. This resulted in strong social changes. The shogun had to resign and emperor Meiji (1868-1912) was enthroned. Japan now began to open herself to the Western culture. In opposite to the time before, when contact with Westerners was strictly forbidden, this now was strongly supported. Western printmaking techniques were introduced in Japan and the traditional woodblock print lost its meaning. It also hadn't been considered to be highest fine art in the Japanese society. But the prints which were exported to Europe caused big admiration there and strongly influenced art movements as the Jugendstil and the new poster movement, and also various single artists as van Gogh, Gauguin and many others. In Japan meanwhile, artists, who came back from studies in Europe, got influenced from the way of European printmakers to design, cut and print their prints by themselves. This resulted in the sosaku hanga movement ("creative print"), which's artists took the process of creating a print completely in their own hands and developed prints of modern expression including abstract images. On the other way, the shin hanga movement ("new print") was initiated from publishers like the famous Watanabe, who wanted to keep the traditional woodblock print alive by publishing prints which were done in collaboration work as in the early days and resembled them also in their themes. The wood of the traditional Japanese woodblock is the wild cherry. 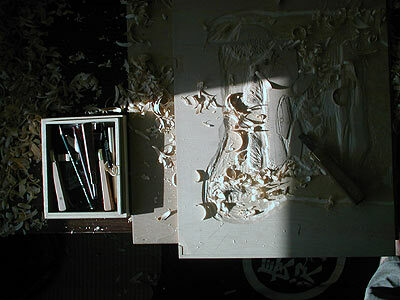 Ill.: This woodblock was cut from cherry wood about 70 years ago after a motif from Harunobus (print see above). The kento marks are visible on the left side of the plate. Cutting is done with the help of several knifes and gouges. The outlines are cut with the line knife hangi-to. This knife is hold in the fist and allows to cut with the highest accuracy. Printing is done by hand. 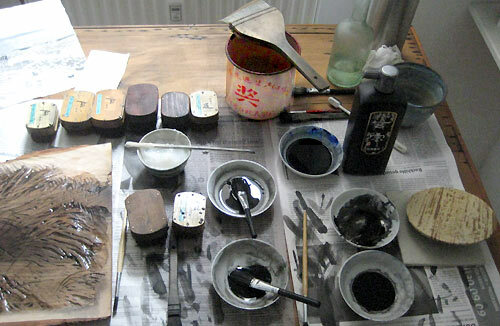 Ink and printing paste are applied to the humid block separately and mixed on the block with a brush to an even layer. The humid paper is placed into the kento marks and printed by hand with a circular printing tool, the baren.